TUCSON, Ariz. (World View PR) – World View, the stratospheric exploration company, announced today that it has successfully executed a Z-Class high-altitude mission commissioned by the NASA Flight Opportunities program office (FOP) for two principal customers, the NASA Ames Research Center and Space Environment Technologies, both of whom are studying radiation detection and its energy levels at different altitudes. The Z-Class mission launched from Spaceport Tucson at approximately 9:39 a.m. PT on Thursday, March 29, 2018. This Z-Class mission, commissioned by the NASA Flight Opportunities program office (FOP), carried two radiation detection experiments. The first, developed by scientists led by Principal Investigator Dr. Meyya Meyyappan at the NASA Ames Research Center, is a chip-based radiation sensor intended to identify various radiations and their unique energy levels in space environments. This high-altitude mission provided the first opportunity to test this sensor and calibrate it against known instruments to develop an inexpensive, small footprint radiation nose system. The second payload, the Automated Radiation Measurements for Aerospace Safety (ARMAS) system, was developed by a team led by Principal Investigator Dr. W. Kent Tobiska of Space Environment Technologies. The ARMAS system uses an innovative approach with airborne dosimeter sensors and ground-based servers to both enhance space science research, and improve aviation safety. While in flight, data from a dosimeter is retrieved in real-time, either via Iridium satellite on research aircraft/balloons or Wi-Fi on commercial aircraft. The data is then downlinked to the ground and used by NASA’s Nowcast of Atmospheric Ionizing Radiation for Aviation Safety (NAIRAS) model of the global radiation environment. When ARMAS data is ingested into NAIRAS, an improved accuracy of radiation dose rates along with airborne flight tracks is accomplished. The goal of ARMAS is to enable air traffic management to monitor global radiation “weather,” thus allowing commercial air traffic to avoid higher radiation areas. One ultimate objective of this research is to reduce crew and passenger radiation exposure by flying in lower radiation regions or spending less time in higher radiation locations. The source of the radiation, whether from galactic cosmic rays, solar flares, or the Van Allen radiation belts, is an example of how the dynamically changing space weather environment can affect the population as we become more technologically advanced. 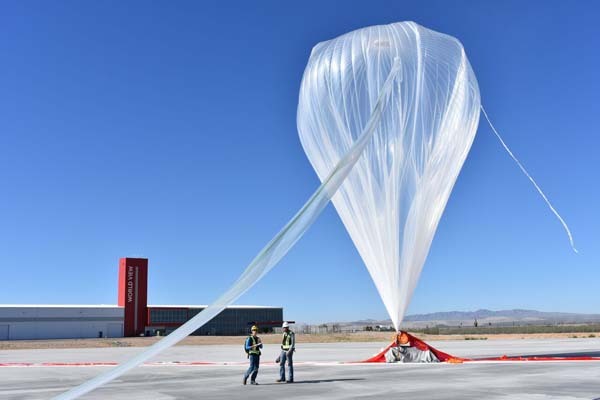 “This World View stratospheric balloon flight of ARMAS truly opens the door to achieving a next step – how we reduce radiation exposure for commercial passengers’ stratospheric as well as space flight within the next five years,” said Dr. W. Kent Tobiska, Principal Investigator for ARMAS. World View offers two distinct stratospheric flight vehicles, Z-Class and the Stratollite. The Stratollite (not used for this mission) uses a unique configuration of balloons to offer breakthrough stratospheric navigation and persistence for long-duration missions. The Z-Class vehicle uses a single zero-pressure high-altitude balloon for shorter duration missions not requiring navigation or persistence. The Z-Class vehicle is a reliable and affordable workhorse option for high-altitude research missions like the one conducted today. Doug, do you know if the balloon used hydrogen or helium? Poynter said that explosion would not happened again. I assume that she meant she would not use hydrogen again. Since that is is the only way it would not happen again. Notice the zero pressure. No breaking windows with that burst balloon. She never said it was a hydrogen explosion, except maybe to the NTSB.